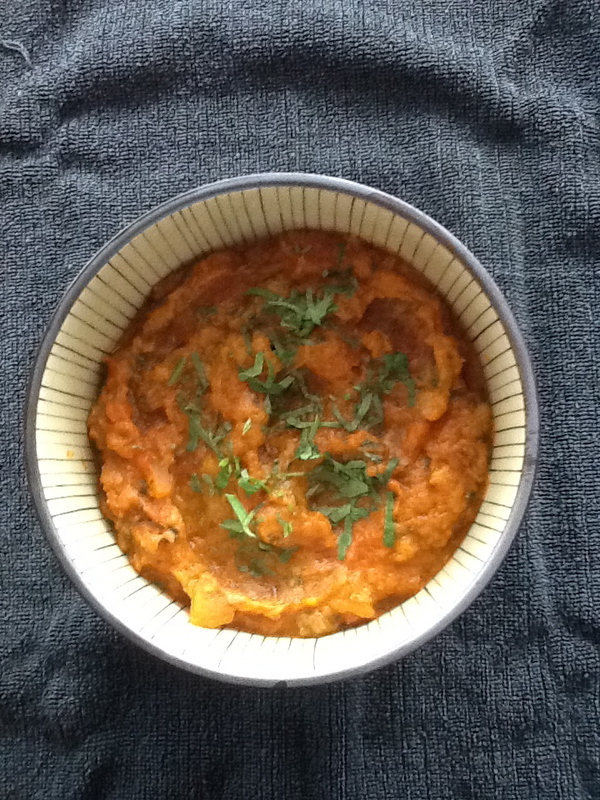 This recipe is from a wonderful book called ‘Cooking at home with Pedatha’ – highly recommended if you love Indian food. First put the lentils on to cook, and then prepare and measure out all the other ingredients before you start cooking the tempering. Cook red lentils with fenugreek seeds and turmeric in ~3 cups of water until very soft creamy consistency – add more water if needed. Make sure it is not too dry, it should be kind of like pouring custard in consistency. Prepare tempering – heat oil in a wok or large deep frying pan, pop the mustard and then add the fenugreek seeds. Lower the heat and once the fenugreek is brown (won’t take long) then add the curry leaves and asafoetida. Add the tomatoes and garlic, and stir and simmer of a few minutes. Add chilli powder if using, coriander powder, fresh chillies and salt and cook until the tomatoes are cooked down into a paste. Add the cooked lentils and simmer for at least a few minutes until you are happy with the consistency, then stir in the fresh coriander. I usually eat a bowl of Dal with a heated roti, and a spoonful of mango chutney. You can buy good quality roti in the refrigerated section of most supermarkets, and I toast them in a sandwich press to heat them through. Alternatively serve with rice.